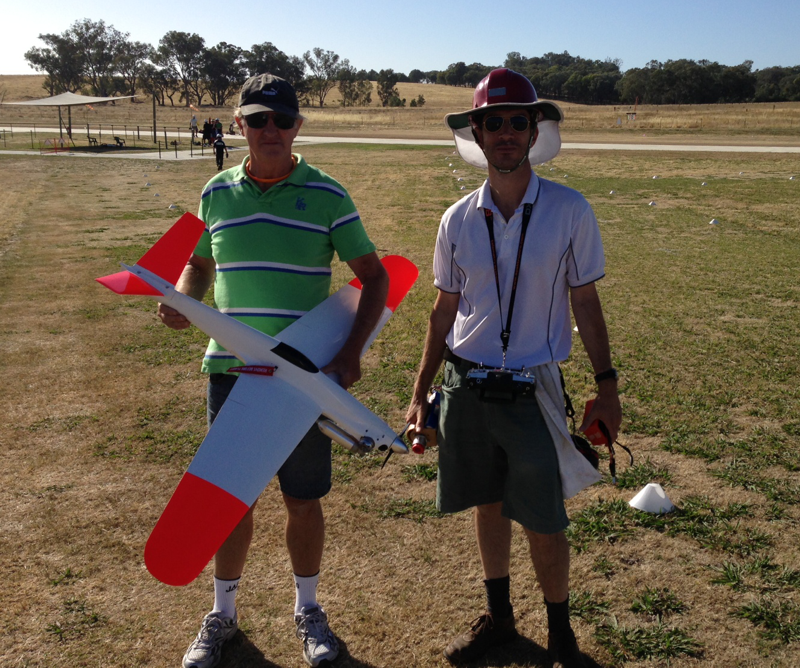 Pylon racing classes for FA1, F400 and Q500 were included in the 67th MAAA Model Aircraft Championships that were held in Albury, New South Wales on 28 to 30 December 2013. 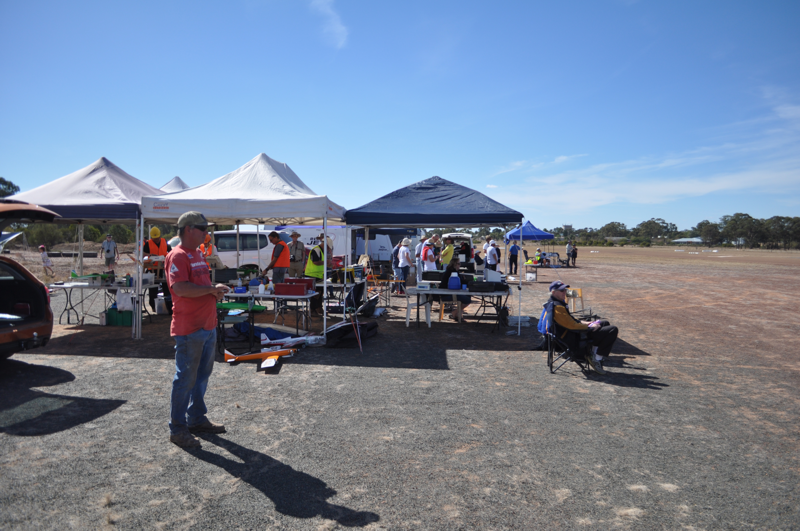 The Nationals was hosted by the VMAA and the pylon event, which organised by the VMPRA, was held at the Twin Cities Model Aero Club’s field. The club provided some of the workers necessary to run the event, with the competitors filling in where possible. 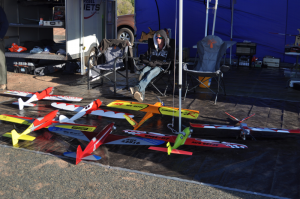 One day of practice and two days of racing were planned, with the objective of running 9 rounds in each class. The flying field had undergone some significant changes since the last time the pylon fraternity had visited. Most notably, there was an impressive concrete runway, which replaced the previous runway that was made from conveyor belt matting. However, a new feature was a permanent pilot station and a large sunshade structure that was located immediately adjacent to the runway. The proximity the sunshade as well as the fencing and a power line that was located on the landing approach at one end of the field meant that the pilots would have a challenge landing their models after each race. 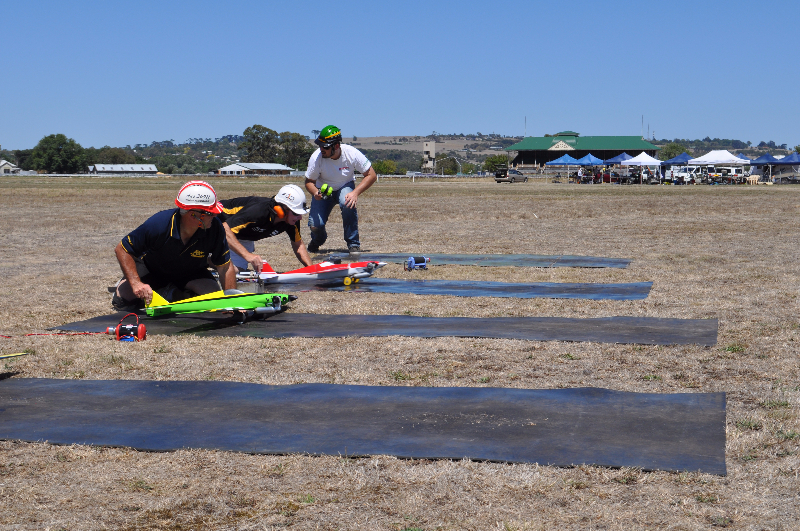 Contestants from Victoria and New South Wales began arriving on Saturday 28th December to complete registration and get in some practice and tuning for the conditions. The temperature was in the mid to high 30’s and there was a Total Fire Ban in place across the border in Victoria. 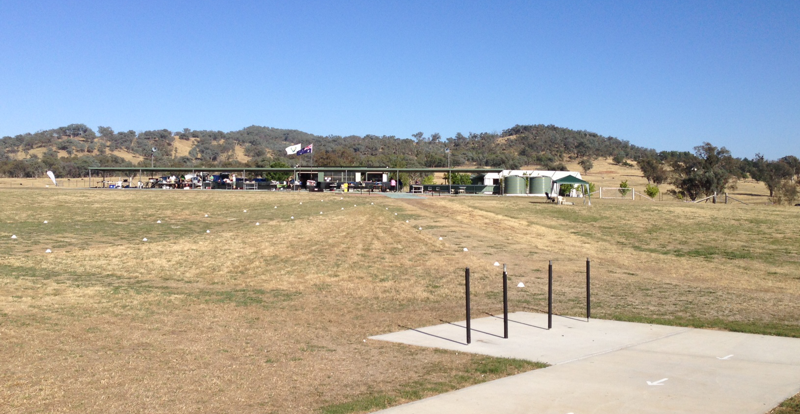 Most chose to put in a few flights before heading back to the swimming pool at their motel for refreshments. 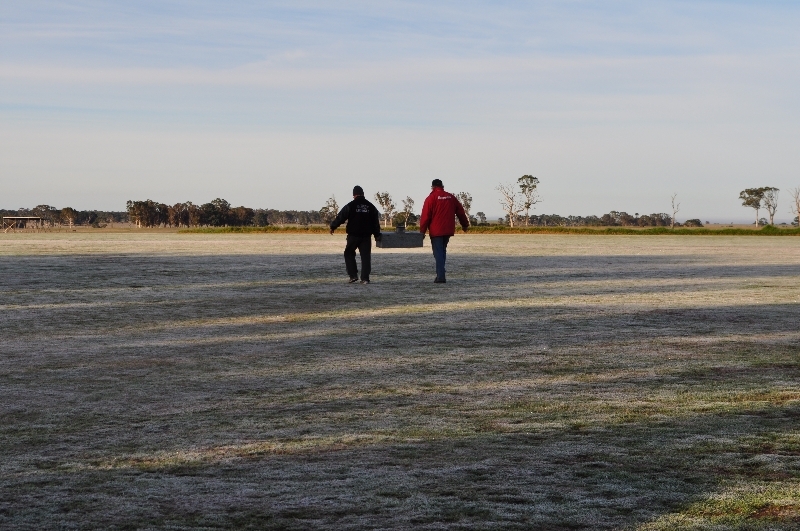 On Sunday morning 29 December, the course was set up to allow for the cross-wind conditions. Racing was conducted over 10 ½ laps, with the timers being located at the No1 pylon. Temperatures were slightly lower than the previous day, but conditions were still very hot being in the low 30’s. 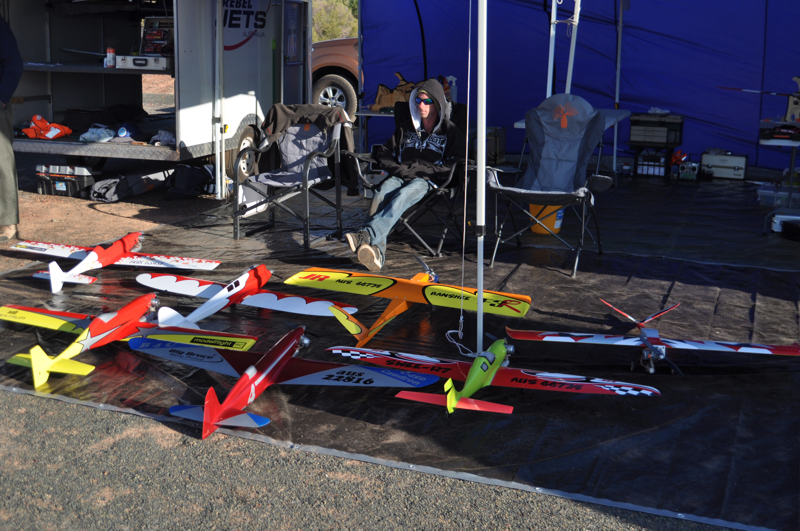 Racing got underway mid-morning with 5 rounds of F400 being flown. There were 10 entries and Ranjit Phelan set the pace with a fastest time of 64.85 seconds. 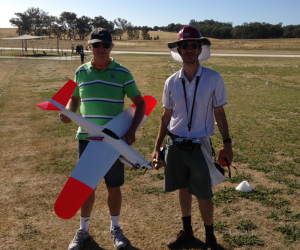 Andrew Davies lost a model when it came in contact with a pylon and others tried to sieve their models through the fences and sunshade structure during landing. Next up was Q500, which attracted eight entries. Daniel Arapakis set the early pace with an impressive time of 94.96 that was backed up with a couple more times in the 95 second range. Jim Orenshaw also posted some impressive 95 second times. FA1 got underway mid-afternoon and there were 10 entries. However, this was the hottest part of the day and the walk to and from the flight line in the heat was beginning to take its toll on the pilots. As a result, only three rounds were flown before it was agreed to call it a day. The heat also meant that the race times were not as fast as are seen at other locations. Before racing could get underway on Monday 30 December the course had to be changed, as the wind was coming from the opposite direction…but still a cross-wind. This took some time as the course had to be laid out to avoid obstacles and to stay clear of the control line area that was being used for other Nationals events. Racing recommenced by mid-morning with four more rounds of FA1 being flown. The heat as well as the rate of attrition increased with both Andrew Davies and Gary Davidson losing models. In the end, Ranjit Phelan flying a model of his own design and manufacture was in first place with a score of 403.4. He was followed by Tom Wetherill with a VooDoo who posted a score of 405.9. Rick Townsend was third with a score of 408.6. Ranjit also posted the best time with a 62.84. Next up was Q500 and four more rounds were flown to complete the class. David Axon and Barry Townsend had a spectacular mid-air at pylon 1, obliterating both models. 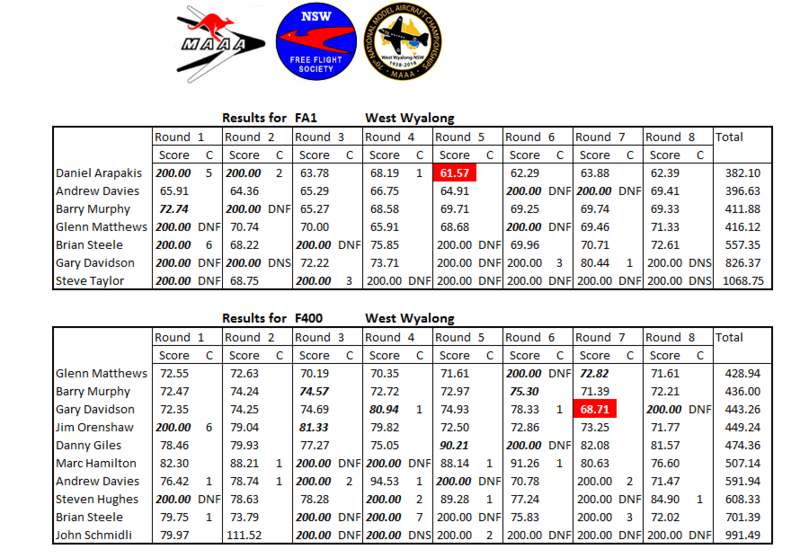 Daniel Arapakis cruised home to first place with a score of 687.2. His time of 94.96 was the fast time for the event. 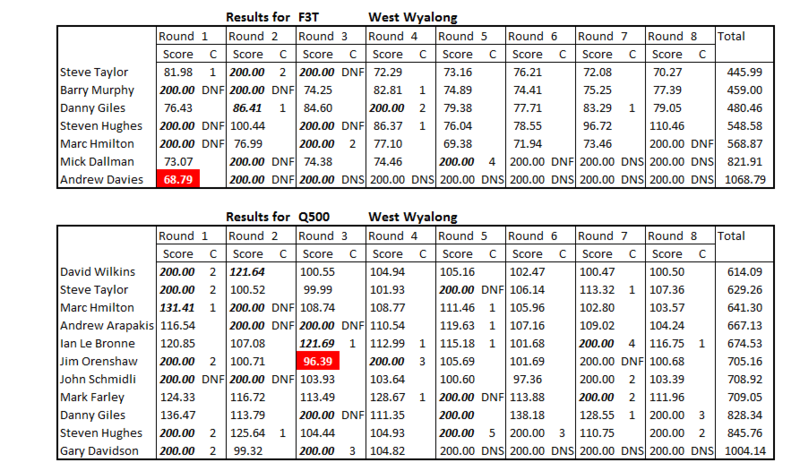 Jim Orenshaw was second with a score of 750.6 and James Hurley was third with a score of 802.5. F400 was up last, with four rounds being flown in the afternoon heat. By this time the pilots and workers were all getting tired and dehydrated so it took some time to get all the rounds completed. The final result was that Ranjit Phelan was in first place with a score of 480.7 with his Nelson powered Polecat. 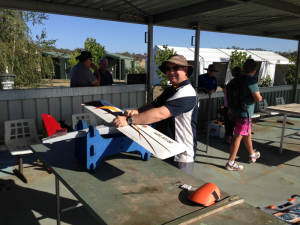 Daniel Arapakis was second with a score of 488.0 with his Nelson powered Terry O’Connor model. Tom Wetherill was third with a score of 512.5 with his Nelson powered Loki. Ranjit’s time of 64.85 seconds from the prior day held as the fast time for the class. It was a sun burned and somewhat weary group that packed up after the event and stayed on for the prize giving ceremony. Trophies were given to the top three finishers in each class. Special thanks were given to Glenn and Nerida Matthews for running the event, Toni and David Axon for working as starters, the people who worked the course and the host club for providing their facilities.